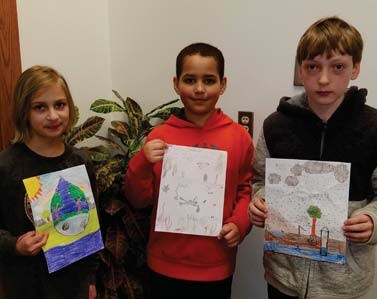 Pictured at right is Water Week Poster Contest winner Kaiden Jackson is flanked by runners-up Josie Fruetel, left, and Connor Wolff. GILBERT – The City of Gilbert works with the Eveleth-Gilbert Elementary fourth-graders each year as part of their Minnesota Wellhead Protection Plan. Gilberts Wellhead Protection plan encourages their water operators to educate our youth on the importance of water. Each year Gilbert operators offer classroom interactive presentations on how to protect our water ways, whether it be consumption, awareness of potential contaminants, simply understanding how the water cycle works, or how water plants treat the water you drink and how it gets to your faucet. Gilbert also participates in the Minnesota Rural Water Association (MRWA) Annual Water Week Poster Contest. Cities from all over Minnesota send in one entry to MRWA. MRWA then chooses the winning cover artwork to be displayed in their quarterly magazine “Today” along with a $100 first place prize. This year’s Eveleth-Gilbert fourth grade submission winner is Kaiden Jackson. Runners up are Connor Wolff and Josie Fruetel. The city would like to thank all the students and teachers for their hard work and efforts. Submitted Terah Trucano-Rinerson, City of Gilbert.